Amid some of the worst flooding in Nebraska history, Iowa farmers have joined together to bring aid to victims. A group of local farmers, led by Robert Broulik and James Garnant, left Iowa Friday morning with an oversize-load semitruck laden with 75 bales of hay. They were moved by the countless images online showing how the Nebraska region has been impacted by recent flooding. It&apos;s been so bad the damage has been visible from space. 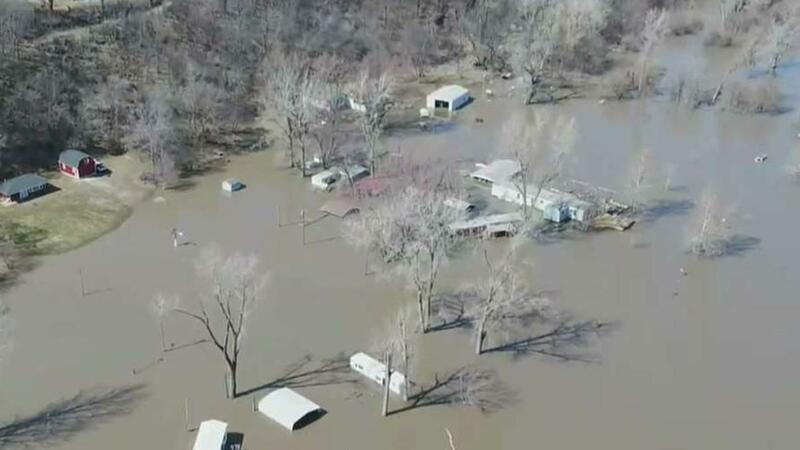 Some areas west of Omaha have been completely flooded or even turned into islands in some cases, forcing residents in dozens of communities to evacuate. "It&apos;s tough to see them people in that kind of shape," Garnant told Fox28. Steve Wellman, the director of the Nebraska Department of Agriculture, said that food such as hay for livestock continues to be the biggest need for flood victims in the area, according to the Omaha World-Herald. That&apos;s a big reason why the farmers and communities have decided to help. The two farmers called each other and put the plan into action, mentioning how they should "take some hay out to the guys in Nebraska." Other farmers in the area caught wind of the idea decided to help. "There&apos;s two other farmers donated hay,” Garnant said. “Some people that knew we were doing it gave us money for fuel and stuff." After word spread around the area, six others had joined the cause. "It&apos;s just kind of what the farming community always does," Garnant said. He added he’s had other farmers help him when he had a medical condition. The truck had a message plastered on the back for all to see, "Iowa Hay to Nebraska Farmers & Rangers Flood Relief". The group said that giving thoughts and prayers is one thing, but taking action is another. The group tried to make it out sooner, according to Fox 28, but they said it took most of Thursday to get the truck loaded with the massive amount of hay. "Took us better part of the day yesterday to just get the trucks ready and get the hay loaded, get it tied down, get it ready to go,” Broulik said before jumping into the truck for the five-to-six-hour drive. “You know, it&apos;s a long ways out there." The farmers had no idea how long it would take or how many miles until they reached their destination of Columbus, Nebraska. "Anybody know the miles?" Broulik asked. "Two hundred fifty?" Whatever the distance, what matters most to this small community of farmers is helping out their fellow American when they need it the most.